The front of my lot has a north-west facing steep slope. It isn’t large, maybe 1/16 an acre. The first land owner, in the 1980s, covered it with a dense geo textile and small rocks and planted trailing junipers. In the years since, the junipers have died and opportunistic species have managed to penetrate the geotextile with their fine roots, cementing it to the land. It’s a sorry area. 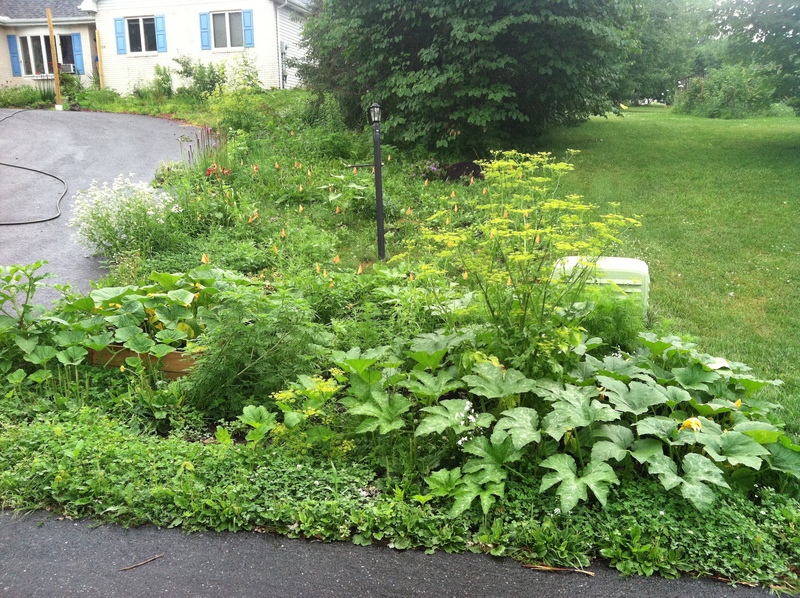 My goal is to establish perennial species and gradually transition the spot into two areas, a butterfly garden, for the area that gets more sun, and a shade garden, for the area that is a bit more north-facing. I also don’t want to mow the area, and our township has a rather restrictive policy of plants that are not cultured with a specific purpose in mind, must be maintained at less than 6″ tall. Good thing that doesn’t apply to children, too! I petitioned with a conservationist argument that the native flowering species have a purpose as pollinators, slope stabilizers, and soil enriching organisms, but the petition didn’t fly. My goal is to get the perennials going and have a clearly purposeful garden established before the township does its drive-by in the spring. 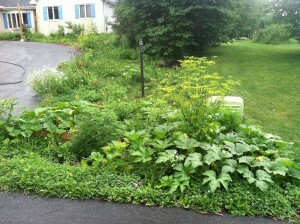 I’ve done a lot of weeding of non-native problems. Primarily wild buckwheat. I suspect this will be an on-going battle. Planted several sugar maples, redbuds, a balsam fir, and a sweet birch in the shady area. Harvested mosses from the slope and have begun culturing them with plans of replanting. I’ve decided to selectively remove parts of the geotextile.removing it at once will de-stabilize the slope, especially before the rainy Pennsylvania Winter. Some fine-rooting plants will be able to root through it. For seed balling, I will cut away regions and remove the roots and weedy seed bank that sits on top of the membrane. Place the perennial seed balls, and mulch heavily with leaves. Have the slope covered with native wildflowers, trees, mosses and ferns. Post a sign inviting people to check out the butterfly garden. There are a lot of kids in the neighborhood, so it is an opportunity to spread my green agenda to the next generation.